Tulips (Tulipa), a bulb plant found across U.S. Department of Agriculture hardiness zones 3 through 8, are poisonous to many animals, including cats. While the leaves and flowers contain trace amounts of toxin, the majority of the poison is concentrated in the bulb. Cats may find the bulbs stored in paper bags in the off-season or may dig up houseplants to retrieve what looks like a playful ball. Tulips contain a mix of mild to moderate poisons. There are two allergens called tulipalin A and B, a glycoprotein and lectin. Together, these toxins create a poison that can irritate the skin if touched, as well as a severe gastrointestinal reaction if ingested. Stories tell of starving cattle in Holland during World War II eating tulip bulbs only to be sickened or die. 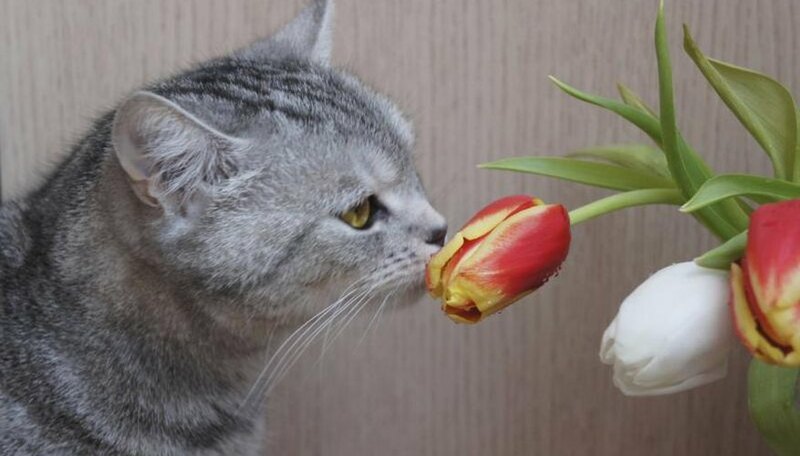 As a small animal, house cats do not need to eat large amounts of tulips to have severe reactions. The first sign of poisoning for a cat can resemble a common stomach sickness or even a hairball. They may drool excessively, vomit or have diarrhea accompanied by an increased heart rate and difficulty breathing. You may notice some redness around their mouth, since the plants are a skin irritant as well. Finally, they may fall into a depression and become lethargic. On rare occasional they may also have convulsions. If your cat has ingested a large amount of the plant, it could be fatal without immediate treatment, and even with treatment they may have a challenging recovery. If you are certain they have ingested a tulip or your pet is showing symptoms of poisoning, contact your veterinarian immediately, or call a pet poison helpline if a veterinarian isn't immediately available. Remove any plant material you see around your cat or hanging from its mouth and gather up a sample of any materials you may see in their vomit or stool to help your veterinarian with identification and treatment. Your veterinarian may administer charcoal or other ipecac to cause vomiting. To help with the irritation, a veterinarian may also prescribe an anti-inflammatory or other medications that assist the stomach lining in healing. While tulips are lovely, it is safest for cat owners to avoid planting them indoors and leave them out of garden areas that your outdoor cat may roam into. If you decide to plant them outdoors, store bulbs in a sealed container in a location a cat cannot access, such as a closet or off-limits room.